Happy Birthday to My Two Pretty Virgos! Oh gosh, it's already end of August? And I've got only 10 posts done this month? I better stop procrastinating and start posting about my bandung trip soon. But before that, I am glad that I did not miss the birthdays of my two pretty virgos, Bella & Marzie! I would like to take this opportunity to dedicate this post to the both of them. Happy Birthday, Bella! Happy Birthday, Marzie! May your birthday be filled with sunshine and smiles, laughter and love. And May our friendships continue to grow in love and trust! Enjoy your birthday with your love ones! I love the both of you!! Hello peeps! We are back!! Miss us? :) I miss you guys heaps! Thank you so much for playing in Guess Where Are We? It's happy to be back and be greeted by you guys. I am so sorry for my late post, it has been a busy weekend here plus i was feeling a little lazy after the trip. But no worries, now that i have settled down, i am back to my blogging mojo again. Alrite, as my post title has spoken for itself, we were at Bandung, Indonesia recently. I know that most of you had guessed Indonesia but i wanted an exact location which is Bandung. I apologies for not mentioning that in my post previously. So, as heartbroken as you are, I am sorry to say that for those who has guessed Indonesia, namely; mymy, Caroline, juli202, Gina Ng, Lee Teng, Maxi and Bluedreamer, your answer is incorrect. Let me make it up to you guys by a month of love linkies at my sidebar. Don't get mad at me, k! And now, to my THREE winners who had guessed Bandung: Marzie, LJ and Shemah, Congratulations!! You girls will each be receiving a souvenir that we've specially bought from Bandung! I won't be revealing what is it, let this be a surprise, k! I hope you girls will like it. I will start posting about our Bandung trip in my next post coz I am still compiling the photos. So, be sure to come back later, ya! In the meantime, a Happy Wonderful~licous Tuesday evening to all of you! Hello my fabou~licious friends and visitors! This is a scheduled post. By the time this post is published, me and my hubby is already on our flight to somewhere beautiful. We will be at this place until this Thurs, the 18th. So, as to not gets too quiet in here, I am organizing a fun contest: Guess Where Are We? When i say contest, of coz there will be some prizes. The prizes will be souvenirs from this beautiful~licious place we are going. Sounds enticing enough for you guys? Okay, the rules are simple, the first THREE persons that comes to me with the correct answer will each get a souvenir from me. Each person is only allowed to guess 2 times. And the clue is: This place that we are going is famous for its local foods such as soto and lotek salad. I can't reveal much but these two keywords are enough for Mr. Google to reveal my whereabouts. Happy Guessing and Have a Great Week ahead! Briyani rice with curry chicken. Briyani rice is usually made of spices and basmati rice. 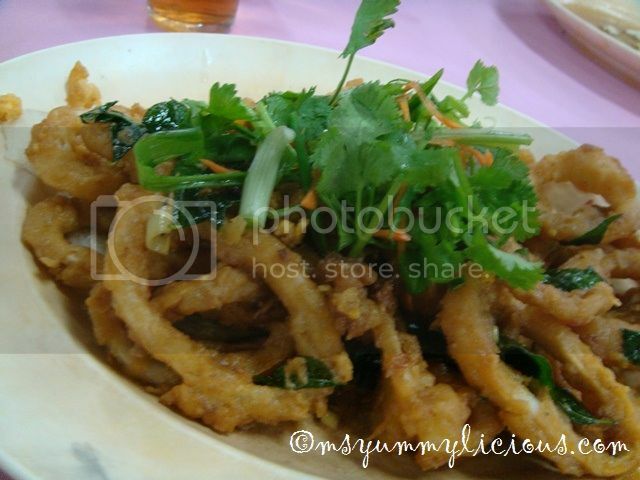 In Malaysia, it is especially served during Malay wedding receptions. Even tho' this one at Mamak Village is not using basmati rice, it still has the fragrant from the spices. Yummy! A stuffed mutton pancake. Crispy thin layer of fried dough with soft minced yummy mutton, comes with pink syrup onion pickle. Ais Batu Campur or Mixed Ice Shaved, is a Malaysian dessert. 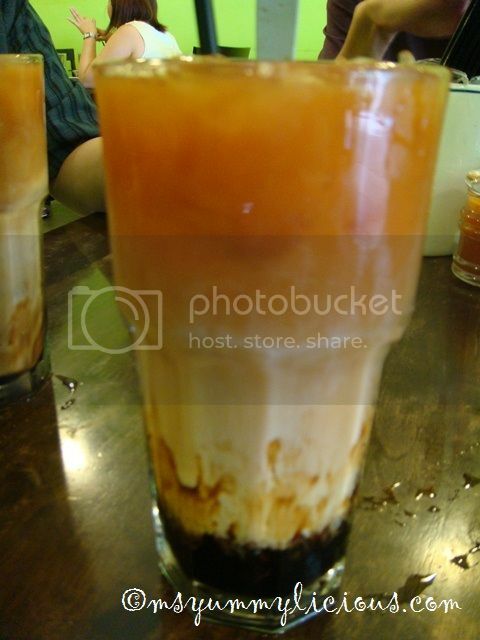 Served mainly in mamak stalls, it is a mixed ice shaved with sweet corns, jelly strips, peanuts, red beans, palm seed and dressed with rose syrup and palm sugar syrup, and finally topped with evaporated milk. A refreshing treat during the hot days! 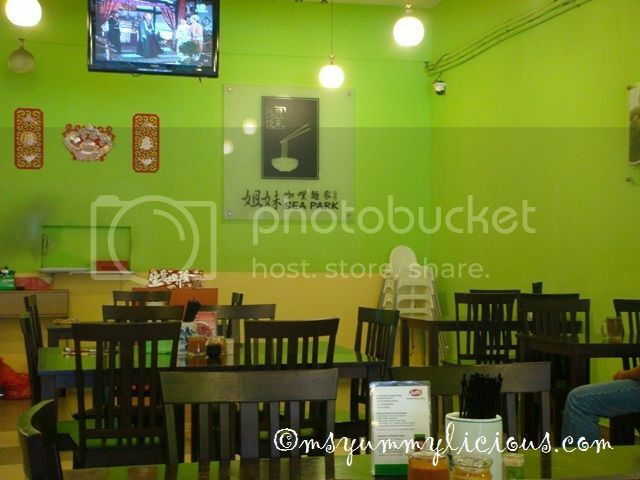 Also famous for its assam laksa and curry laksa. My hubby used to stayed in SS1 when he was a young boy. He loves eating curry laksa at this particular hawker stall in a restaurant at Seapark. This hawker stall is called Sisters Curry Laksa which is operated by two sisters. 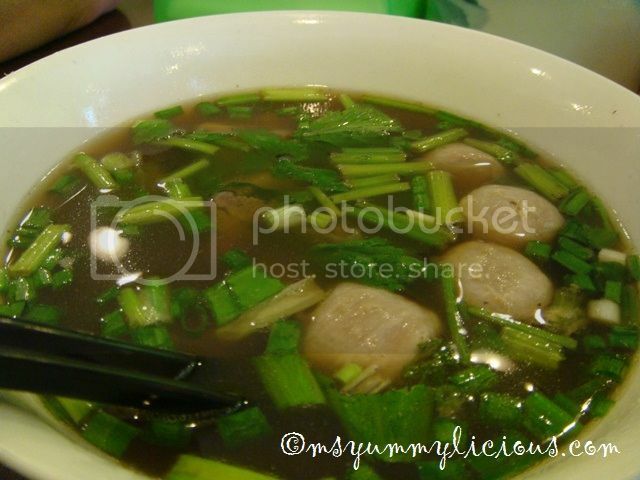 But ever since he shifted to Subang Jaya, he seldom eats there anymore. So, when he found out that there is a new branch opening in Bandar Puteri Puchong, he did not hesitate to bring me there. Truly, it was the best curry laksa! No wonder he misses this curry laksa so much! There is also a stall in Putri Mart Foodcourt. Mee of your choice in curry soup with fried beancurd, long bean, bean sprouts and perfectly cooked cockles. Yummy~licious beef balls, beef briskets and beef tripes. This drink is my latest crave! I love it! A layer of milk sandwiched in between layers of fragrant tea and palm syrup. When mixed together, you can really taste the great combination of these three flavours! Simply refreshing and addicting! 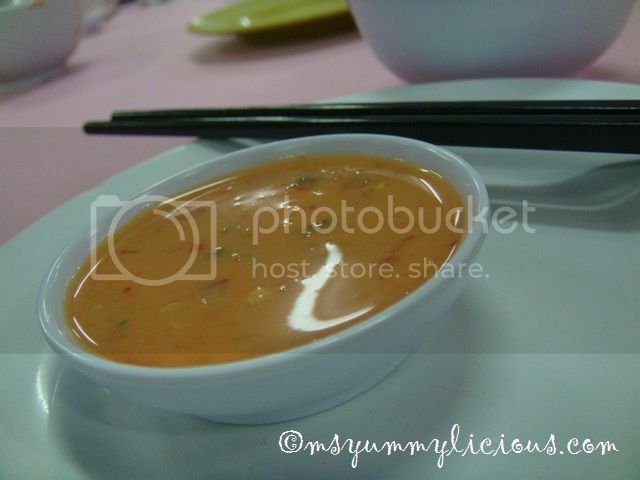 An added point for those who wanted to try out this yummy~licious curry laksa. Since all my trip photos were taken from my friend's camera, i have no choice but to skip blogging about my awesome trip first until my friend had forwarded the photos to me. So now, i will blog about the next day instead. 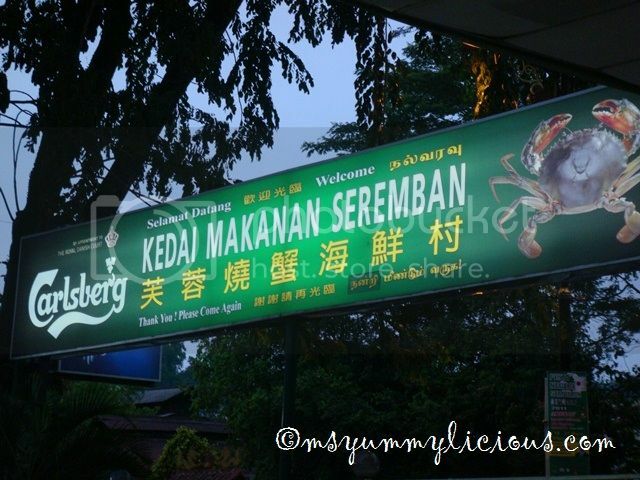 On our way home from Port Dickson, we stopped by Seremban for some yummy crabby dinner. 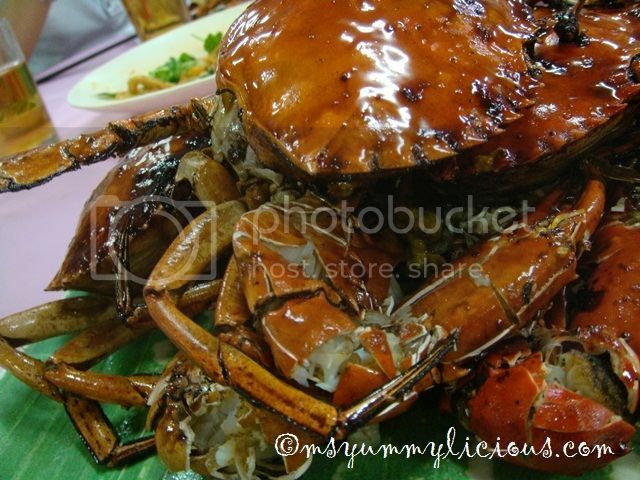 This restaurant is very famous for its BBQ crabs. 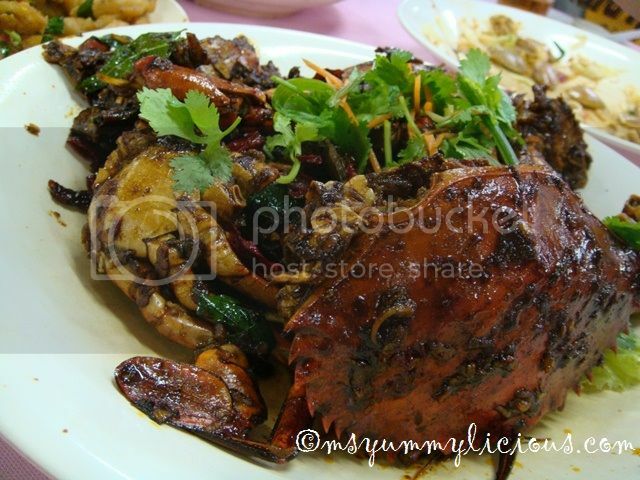 But apparently, it is only the crabby dishes that pleases my peculiar taste buds. The sticky sauce tasted something like marmite but not exactly. It has a little of sweetness and saltiness, both at the same time. Yumm.. 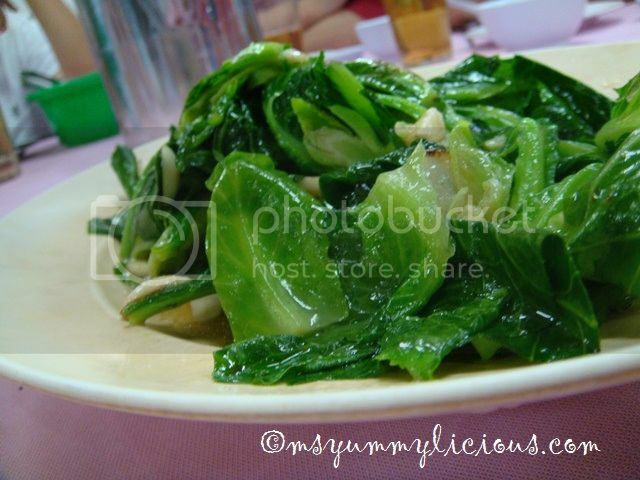 Very fragrant dish! And spicy too! Love it! The squids were soggy instead of crispy and taste was bland. 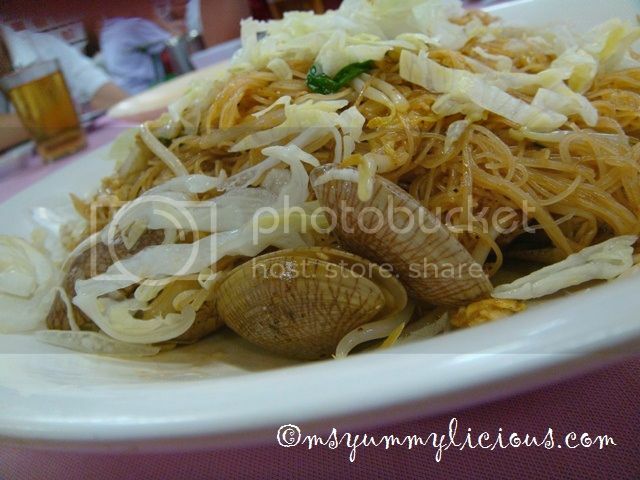 The worst fried meehoon i've ever tried! Total dissapointment - tasteless! My friend like this sauce but for me, it's only all right. Do make a booking first before you go, coz by 7pm, it is already full house. 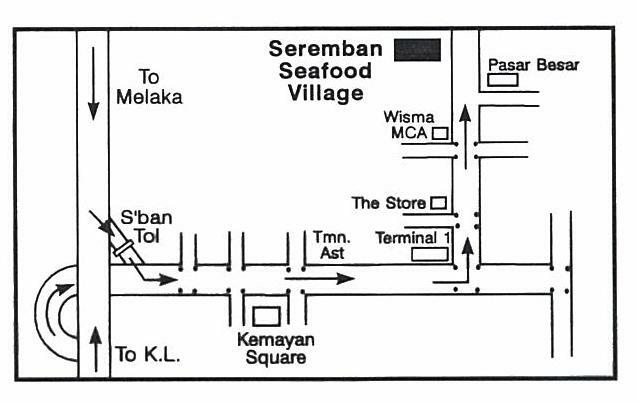 map taken from I Just Wana Eat!